What difference does 1 Lousy Rain Barrel make?! ﻿Through a series of coincidental meetings (the third being a clear indication for action) I enrolled and was accepted into the Watershed Stewards Academy (WSA). For the next several months I have/will attend evening classes at the Arlington Echo Outdoor Education Center in Severn, Md. along with weekend intensive trainings in various locations throughout the County. “The quintessential role of Master Watershed Stewards (which I intend to be one of) is to organize community action toward the restoration and preservation of our watersheds” and, in particular, to learn, in depth, pollution source reduction strategies – Capturing water at its source is still the best way to reduce the pollutant load it carries to a stream. During one of the first evening lectures Stephen Barry, the coordinator of the Outdoor/Environmental Education, told us future Stewards that we would be getting our very own rain barrel. I thought, great, 1 barrel – how much good will that do; I don’t even have gutters. Don’t get me wrong, I know the value of water and never take it for granted; turning the shower off while I soap up and the like. I’m incensed when the media refers to rain as a ‘threat’ as if it is some terrorist when, if fact, it’s our life source. For those of you who have read my previous blogs and articles, you know how involved Petro has been, in addressing homeowner’s drainage concerns. Typically, when someone is experiencing a wet or moldy basement they want the water as far away from the house as possible. Pollution source reduction includes keeping the water on-site. Sometimes, depending on the soils, topography of the site and the homeowner’s maintenance involvement, this can be accomplished through rain gardens. Alternative, adequately designed buried dispersion systems are lower in maintenance but not quite as organic or attractive. 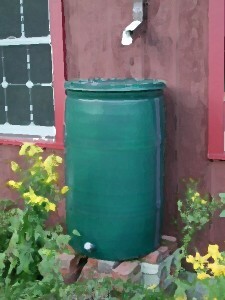 Rain barrels, on the other hand, can be used by everyone immediately and with relatively little cost. But what good is just one? A couple of years ago we distributed our own eco-friendly tote bag that can be folded in for easy carrying. I always have one in my purse or clipped to my belt for use wherever needed. A lot of people bring there re-usable bags to the grocery. I noticed that nearly no one used them in drug stores or other non-grocery shops. In using my bag everywhere I’m hoping to encourage others to do the same. One of our residential analysis projects this past weekend included an opportunity to assess and present ways that a particular homeowner might keep his water on his site. With little or no yard and the access areas at a minimum, one of the stewards suggested a rain barrel at the front driveway downspout. The homeowner immediately said ‘not an option’ as it would not be aesthetically pleasing. This particular home was located on a prominent corner in a waterside community that was in much need of pollution source reduction for the good of everyone. I thought, what a great example this one rain barrel would make prominently placed in the front yard; sort of like using my own bag everywhere! So this one rain barrel, that I will get, will make a huge difference as an example to others of what little it takes to help maintain our planet. One of our assignments was to read The Chesapeake Watershed: A Sense of Place and a Call to Action by Ned Tillman. It’s a great geological and historic account of how our watersheds developed and declined with specific action plans available to individuals, corporations and government; inspiring, depressing and a critical assessment of our immediate watersheds. We were fortunate to have the author at one of our evening seminars. His first question to the group was, “Do you remember a specific outdoor location/space that you felt connected to as a child?” There were warm memories from Maine, Indiana to Florida mostly inspired by family outings as a child. “This is why you’re here” Mr. Tillman said, “…these fond memories of your life in the outdoors having inspired you to take action to preserve it.” Today our children are inside on electronic equipment, what memories will inspire future preservation? This is where I’m heading. This Holiday Season we will send out a 2011 guide to 3 local outdoor destinations per month where you and your family can experience the best of what is available in outdoor activities and locations. One trip per month can have a lasting effect.